Hey, everybody! What an interesting weekend I had. I met with a nice family and had a sleepover at their home! My foster mom and dad cried when they dropped me off, but I didn’t understand why. Unfortunately one of the other dogs and I both wanted to be in charge. So my foster mom picked me back up the next day and told me they wanted to be promoted from “foster parents” to just “parents.” I happily accepted and have been home ever since playing with my brothers. Sometimes your forever home is closer than you think! 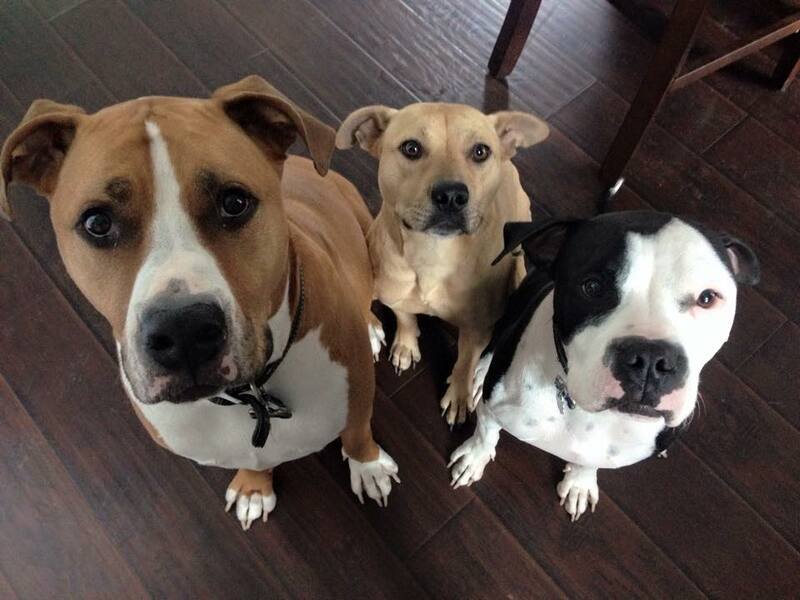 Sam, Sevi & Buddy: 3 beautiful pit bulls. I am thrilled to share this story with you. Sevi is a beautiful female pit bull mix (pictured in the center) who, along with Leyla (also a pit bull) and their human advocate Charlotte (a Texan) inspired me to do what I can to help our four-legged friends. It took a year, but Sevi now has her furever home! Congratulations Leyla, Sevi, and Charlotte on your happy endings! Next > Riddle Memee This! They are all gorgeous. My wife, Cynthia, would have fallen in love with the black and white pit bull, on the right side of the picture.